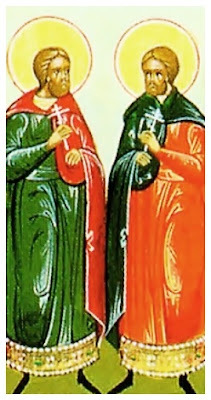 The Holy Martyrs Processus and Martinian were pagans and they served as guards at the Mamertine prison in Rome. State criminals were held in this prison, among them some Christians. Watching the Christian prisoners and listening to their preaching, Processus and Martinian gradually came to the knowledge of the Savior. 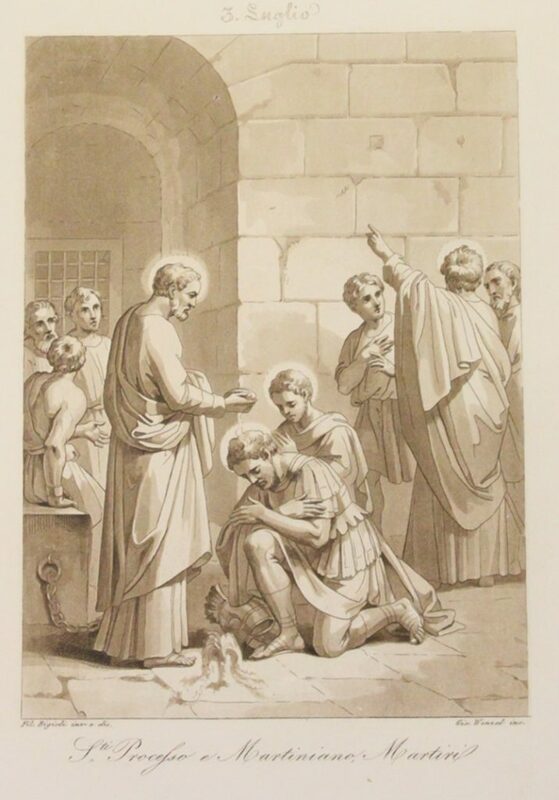 When the holy Apostles Peter and Paul were locked up at the Mamertine prison, Processus and Martinian came to believe in Christ after a spring flowed miraculously in the prison. They accepted holy Baptism in these miraculous waters from the Apostle and released him from prison. A certain illustrious and pious woman, by the name of Lucina, visited them in prison and gave them help and encouragement. The torturer Paulinus was soon punished by God. He fell blind and died three days later. The son of Paulinus went to the city ruler demanding that the martyrs be put to death. Saints Processus and Martinian were beheaded by the sword with the Apostle Paul around the year 67. Lucina buried the bodies of the martyrs originally in an apostolic era cemetery along the Via Aurelia, in the Cemetery of Damasus or at the catacombs of St. Agatha at the road's second milestone, on July 2. Martinian and Processus were publicly venerated in Rome from the fourth or perhaps the third century. 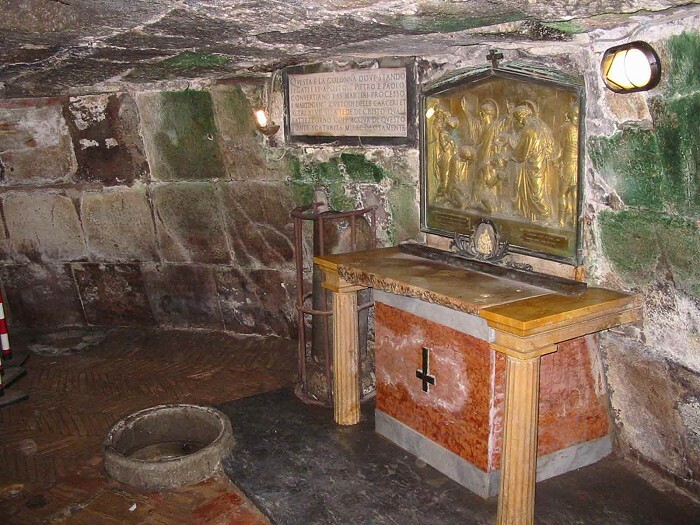 In the fourth century, a church was built over their tomb. 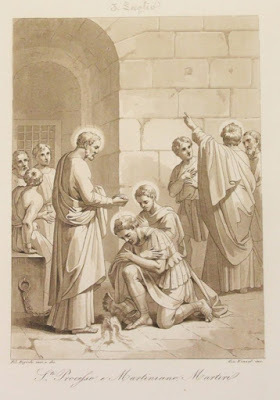 At this church, Saint Gregory the Great preached a homily on their feast day "in which he referred to the presence of their bodies, to the cures of the sick, to the harassment of perjurers, and the cure of demoniacs there." This church no longer exists. Bede mentions Martinian and Processus, and their feast is thus known to have been celebrated in early medieval England. 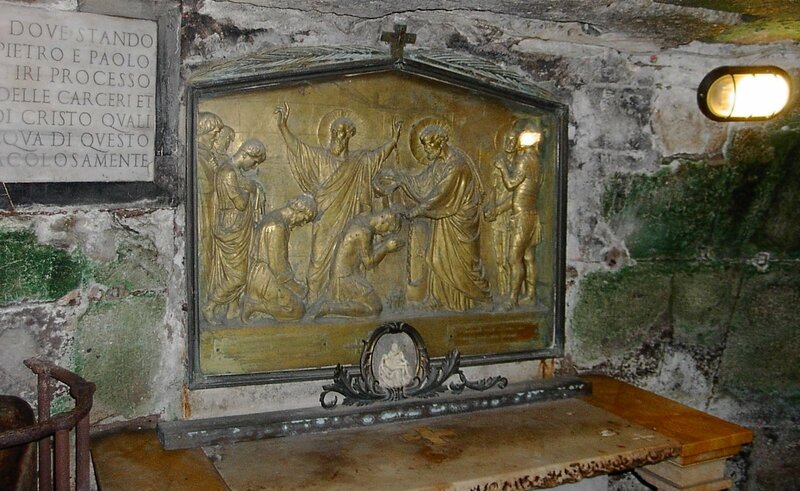 Pope Paschal I (817–24) translated the bones of the two martyrs to a chapel in the old Basilica of St. Peter. They still rest under the altar dedicated to them in the right (south) transept of the present St. Peter's Basilica. In 1605, their relics were placed in a porphyry urn under the altar at St. Peter's, which is flanked by two antique yellow columns. The hemisphere has three roundels with scenes from the life of Paul the Apostle.